It has been theoretically predicted (Roberts et al. 1983, 1984) that the periodicity of magnetoacoustic modes can be modified by the time evolution of an impulsively generated signal. One of the obvious sources of such a disturbance is the impulsive flare process. These magnetoacoustic waves are trapped in regions with higher density (e.g., in coronal loops) acting as waveguides. The impulsively generated wave in such a coronal waveguide exhibits three phases: 1) periodic phase (long-period spectral component arrives as the first one at the observation point), 2) quasi-periodic phase (both long and short-period spectral components arrive and interact), and finally 3) decay phase. The numerical simulation of characteristic time signatures of impulsively generated magnetoacoustic wave trains propagating along a coronal loop has been studied by Nakariakov et al. (2004). It was found that these wave trains have a characteristic tadpole wavelet signature where narrow-spectrum tails precede broadband heads. Here, for the first time, we report the tadpoles detected in the wavelet spectra of dm-type IV radio bursts. The 2001 June 13 flare (classified as M7.8, GOES X-ray maximum at 11:42 UT) was observed during 11:22—12:18 UT in the active region NOAA AR 9502. 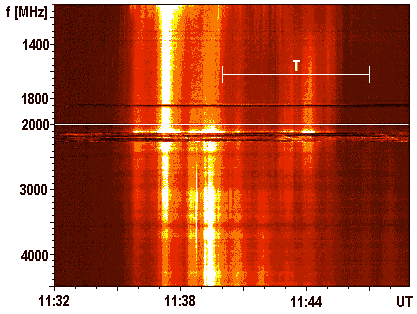 The observed 17-minute duration (11:32—11:49 UT) decimetric type IV radio event (Figure 1) was recorded by the Ondrejov radiospectrograph with 0.1 s time resolution. The analyzed type IV radio event consists of smooth continua (without fine structures) in the whole frequency range. We have studied 419 radio flux time series at individual frequencies from 1.1 to 4.5 GHz during the time interval 11:32—11:49 UT. Characteristic periods with tadpole pattern were searched for in the radio flux time series by wavelet method. The tadpole patterns are evident in the wavelet power spectra in the time subinterval T (11:40—11:47 UT, Figure 1) in all of the 419 time series. We have presented three examples of tadpoles (Figure 2, panels B) outlined by contours at the 99% confidence level and the hatched regions belong to the cone of influence. The spectra are plotted with the lighter areas indicating greater power. We can see the rather periodical tail as well as the quasi-periodical head of the tadpole. The long-period spectral components (tadpole tail) with the characteristic period P propagate faster than the medium and short-period ones (tadpole head). These tadpoles last 300—370 s. They have the characteristic period P = 70.9 s and their flux profiles show a low number of wave oscillations (4—5) which means that their damping is rather strong (Figure 2, panels C). All of the radio fluxes are significantly correlated which agrees with the commonly accepted fact that this type of the dm-radio burst (broadband smooth continuum) is generated by the gyro-synchrotron emission mechanism. Figure 1. Decimetric type IV radio spectrum recorded by the Ondrejov radiospectrograph. Tadpole wavelet patterns were recognized in the time subinterval T (11:40—11:47 UT). Figure 2. Characteristic examples of the tadpoles (from Mészárosová et al. 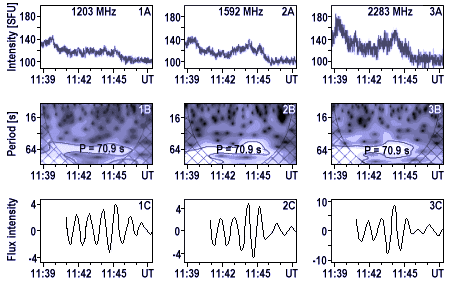 2009a) detected on selected radio frequencies in the subinterval T. Panels A show original time series. Panels B show corresponding wavelet power spectra with tadpole patterns. Panels C show the radio fluxes computed by the inverse transform from the tadpole wavelet spectra for the period range 40—100 s around the characteristic period P.
In accordance with previous studies (e.g. Nakariakov et al. 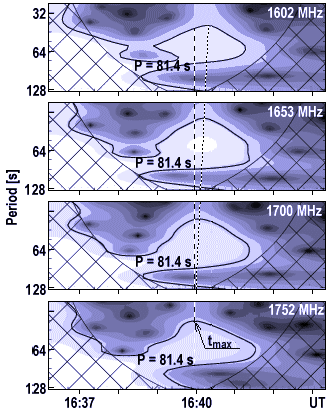 2004) we interpret the presented tadpoles as a signature of the magnetoacoustic wave train moving along a flare loop. We expect that the wave train modulates the gyro-synchrotron emission through a variation of the magnetic field in this train. Alternatively, this wave train can modulate the process accelerating superthermal particles producing the gyro-synchrotron emission. Finally, the existence of these tadpole wavelet patterns can provide evidence of the wave train in the flare loops, and their characteristics (e.g. period, longevity and shape) can provide information about the parameters of the oscillating loops (for more details see Mészárosová et al. (2009a). The 2005 July 11 radio burst (GOES X-ray class C0.1, maximum 16:38 UT) was observed after the flare (class C8.4, maximum 15:08 UT) in the active region NOAA AR 10786. The observed 10-minutes duration (16:34—16:44 UT) decimetric radio event was recorded by the Ondrejov radiospectrograph with 0.1 s time resolution. This dm-radio event consists of fiber bursts (Figure 3) in the frequency range 800—2000 MHz. We have studied 39 radio flux time series at individual frequencies from 1602 to 1780 MHz during the time interval 16:36—16:43 UT. Characteristic periods with tadpole pattern were searched for in the radio flux time series by wavelet methods. The tadpole wavelet signatures were recognized at all the 39 frequencies in the time interval T = 16:38—16:41 UT. The duration of the tadpoles range from 89—184 s. Four characteristic examples of the tadpoles are shown on Figure 4. The individual panels show the wavelet power spectrum with the tadpole pattern outlined by contours at the 99% confidence level and the hatched regions belong to the cone of influence. The spectra are plotted with the lighter areas indicating greater power. The four white dots on Figure 3 indicate the time tmax of tadpole head maximum at four selected frequencies. These drifting tadpoles in the wavelet spectra of the radio emission associated with the fiber bursts were detected at all radio frequencies in the 1602—1780 MHz frequency range. The characteristic period P of the wavelet tadpole patterns was found to be 81.4 s and the frequency drift of the tadpole heads is -6.8 MHz s-1 (white arrow on Figure 3). Figure 3. Decimetric radio spectrum of the 2005 July 11 bursts recorded by the Ondrejov radiospectrograph. Frequency drift of the individual fibers in 1400—1800 MHz frequency range is -107 MHz s-1 on average. Frequency drift of tadpole heads is -6.8 MHz s-1 (see arrow). Four white dots indicate the time tmax of tadpole head maximum at four selected frequencies. Figure 4. Characteristic examples of wavelet power spectra with tadpole patterns detected on four selected radio frequencies (from Mészárosová et al., 2009b). Dashed line represents time tmax of the head tadpole maximum at 1752 MHz. Dotted line shows frequency drift of the tmax value towards to lower frequencies. In accordance with the papers by Nakariakov et al. (2004) and Mészárosová et al. (2009a) we interpret the tadpoles found in the wavelet spectra of radio emission fluxes as a signature of the magnetoacoustic wave train moving along a dense flare waveguide. But contrary to the tadpoles, which heads were observed at the same time and interpreted through the gyrosynchrotron emission (Mészárosová et al. 2009a), the heads of the present tadpoles clearly drift towards low frequencies. It indicates that the radio emission, which is modulated by the wave train and having thus the wavelet tadpole structure, is produced by plasma emission mechanisms. The simultaneous observation of fiber bursts with tadpole structures support this idea. Using the Aschwanden density model of the solar atmosphere only low values of the Alfvén speed and the magnetic field strength in the loop guiding this wave train were derived, which indicates a neutral current sheet as the guiding structure. Furthermore, the analysis supports the model of fiber bursts based on the whistler waves (for more details see Mészárosová et al. (2009b).